For Reppublika we worked in product development, created the branding and web design, developed the entire web app and the marketing. 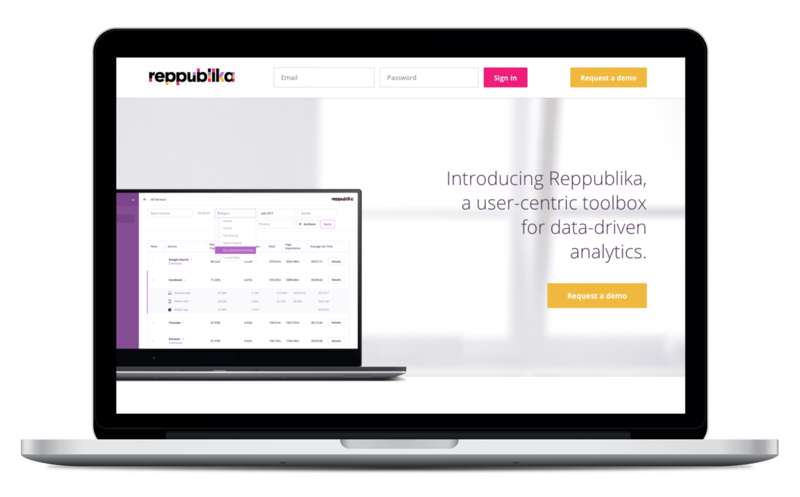 Reppublika is the user-centric toolbox for data-driven analytics. Gain insight into the browsing habits of key demographics and target for maximum advertising impact. Reppublika Ratings+ measures app and browser usage through its own, representative online research panels. Participating users voluntarily install on all their devices a specialist software tool that tracks usage across all visited services. 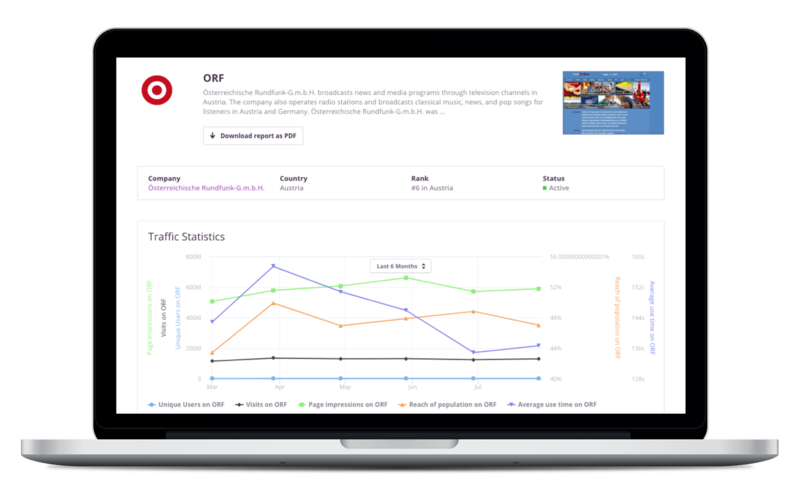 The resulting data is extrapolated and projected across the online population, and can be access through a user-friendly dashboard that allows filtering and detailed breakdowns. Reppublika Ratings+ for Publishers provides media agencies, planning tools and ratings services with data on reach and user structure across the spectrum of a country's online offer, all based on the user-centric tracking process of Reppublika Ratings+ — with it's proprietary, representative online research panels and the accuracy of world-class tracking software. 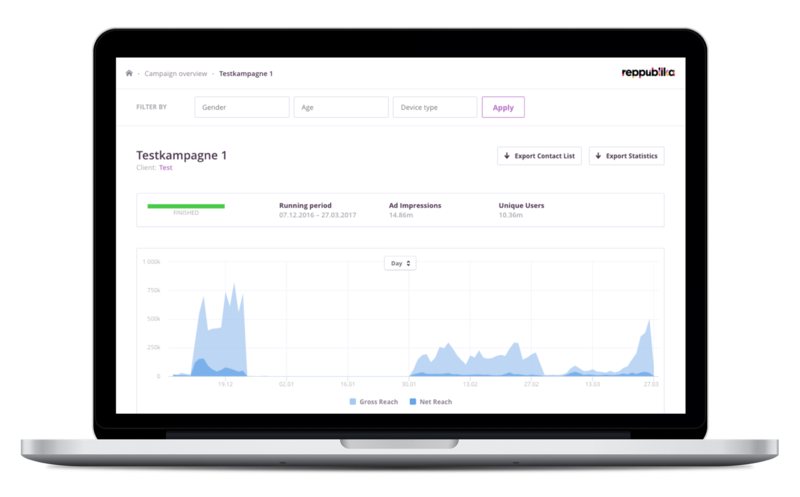 Reppublika Campaign Control Reppublika Campaign Control is the ultimate control center for monitoring and optimising your online advertising campaign: it measures impressions and target group accuracy, and utilises automated viewer surveys to establish the effectiveness of your ad based on predefined Key Performance Indicators such as Recall, Recognition, Appeal and Purchase Probability. No more guesswork or waiting to assess a campaign after it is finished and the budget spent — tweak and correct in real time, see results already a few hours later.